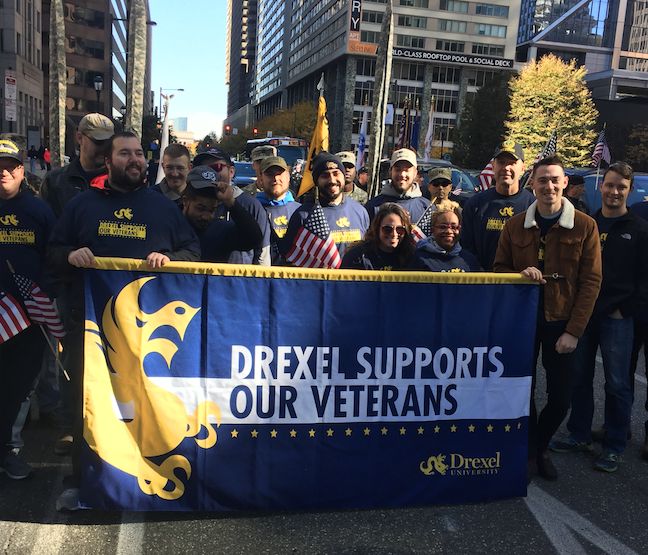 Patriotism filled the streets of Philadelphia as the Drexel Veterans Association and members of the Veterans Task Force represented Drexel University in the 4th Annual Philadelphia Veterans Day Parade Nov. 4, as part of the university’s Veterans Appreciation Month. In celebration of veterans and other members of the military community — just ahead of the official holiday — thousands of participants made their way from 16th Street and John F. Kennedy Boulevard to 5th and Market streets, surrounded by gratfied cheers, waving flags and lively music. “A lot of people came out to show their support,” Colton Smith, a junior studying mechanical engineering who marched in the parade, said. Smith, an Army veteran, said the parade seemed much bigger than last year’s, which led to a better experience overall. He explained that the increase of size was apparent not only in the large crowds gathered on the streets, but also in the number of organizations and companies that came out to join the festival that marked the end of the parade on 5th and Market. Otis Hill, a senior studying legal studies and a former Navyman, agreed that this year’s parade seemed to surpass last year’s, noting that it lasted longer. This year, over 150 organizations totaling over 3,000 participants were involved in the parade. Representatives from Drexel’s veteran services team tabled to share information about the university’s veteran resources alongside an array of other veteran-oriented organizations, including the Military Assistance Project, Veterans Multi-Service Center, National Federation of Black Veterans Network, New Beginnings and Women Veterans ROCK! The festival portion of the parade was a favorite among many of the Drexel students who marched, including Stephen Rohr, a junior studying mechanical engineering and technology. Past an assortment of food trucks, there was a beer garden with live music, which Rohr, a U.S. military veteran, said was the perfect place to unwind with the other veterans. “The atmosphere was great,” former Marine, Austin Svoboda, a psychology major, added. Svoboda said he was impressed by how many people attended. He was also happy to see the variety of organizations tabling, which he said included companies that were recruiting veterans, as well other businesses that showcased discounts and other services offered exclusively to veterans. Overall, he was happy to witness the community support — a shared feeling amongst many of those who happily marched in the name of Drexel. “I saw a lot of support today,” Ethan Sewell, a pre-junior economics major who served in the Marines, said with a smile. “It was cool to march in it and see all the Philadelphians who came out to support us,” Matthew McKeever, a pre-junior studying marketing, added. McKeever, who served in the Navy, said his favorite part was when parade officials announced the university’s name during the march. “It was nice to be recognized as a school,” he said. About 30 people represented Drexel in the march, according to Anwar Hasan, a mechanical engineering sophomore who served in the Air Force. Hasan said he also enjoyed meeting up with everyone. Not only did it connect them with members of the community, he said, but it also gave veterans at Drexel an opportunity to spend time together. Andrew Sauter, an electrical engineering freshman, was also happy to spend time with other Drexel veterans. Overall, he said it also coincides with the university’s overall dedication towards the military community. While he enjoyed being connected to fellow veterans, he said he’d like to see even more veterans come out next year. “I’m excited to see how we grow,” he said.